Thanks to Scott's Liquid Gold I have been give the opportunity to begin preserving and restoring my dining table back to its formal beauty. My dining table and buffet hutch are made from a dark wood. This set has been in our home for a very long time. With daily use the original luster and shine has faded. After trying this polish for about two weeks I was amazed at the improvement in the shine and beauty that has returned. The product is made from a blend of natural organic oils that clean and moisturize wood. Keeping wood moisturized helps to preserve the wood. 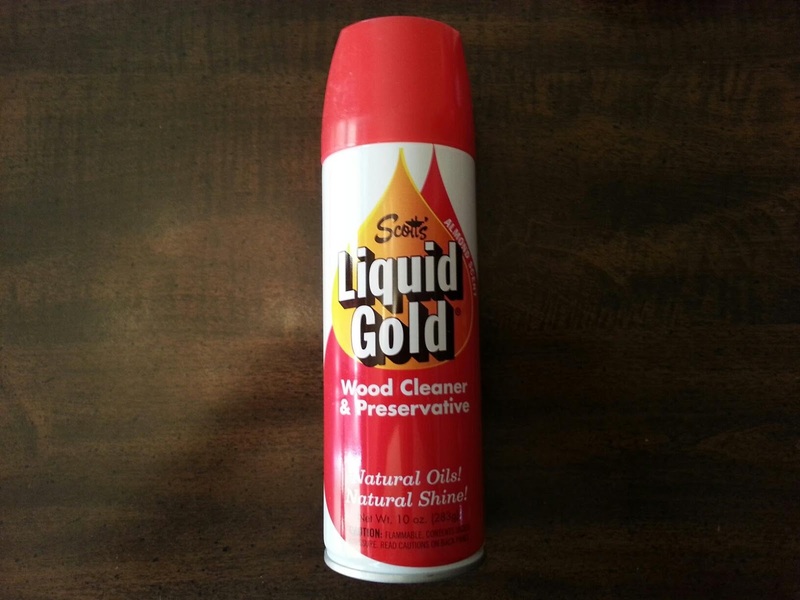 Scott's Liquid Gold is not a furniture polish it is considered a wood cleanser and preservative.The product does not contain water, wax or silicone. Below is a photo of the first time I tested the product. I have circled the newly polished area in red. I hope you can see the difference. This wood cleanser works great on wood furniture, unfinished wood, paneling, and most any wood furniture. Not only is it a great furniture cleanser but it can polish brass, stainless steal and chrome. 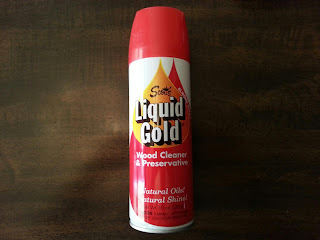 I have a little tip to share with you on the best way to use Scott's Liquid Gold or any furniture polish. Spray your rag not your furniture. 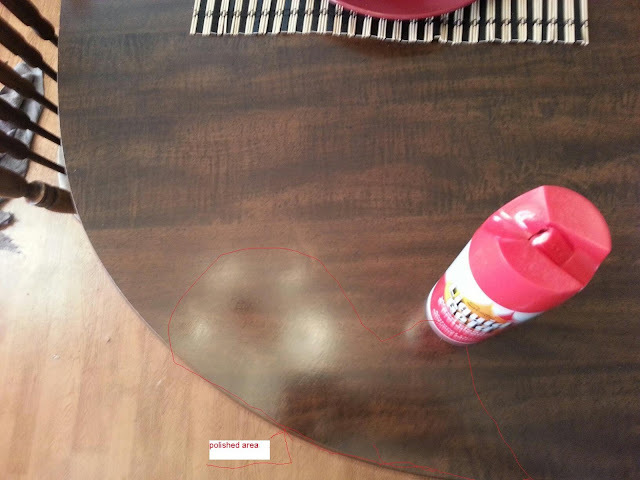 Spraying your rag will insure an even glossy shine to your furniture. That worked great on that one spot on your table. Now you are going to have to do it all. I used to use Scotts Liquid Gold,.. not sure why I stopped. I never even thought of this. I should use this on my table. It's looking pretty rough from the girls. I miss it when it was shiny and new. ): Your table looks great!! I have used Scotts Liquid Gold for years. It's nice to see an 'old' product still doing well. Never thought about spraying the rag instead of the table. Thanks!